As the Justin Trudeau regime lurches toward its promise of legalizing cannabis use in Canada, a steady stream of products and services meant to help the public exploit the new freedom in as many ways as possible hits the marketplace. Legalization may be a case of opening the barn door decades after the horse has already gone (since millions of Canadians supposedly use the stuff already), and even though the evil weed isn't yet legal, you can go to many places right now and pick up both the consumables and the accessories with which to exploit them. My best friend has regaled me of tales of communities of British Columbia where you can stroll into a shop and come out fully loaded. Beyond the mere ability to get faced, there is a strong case to be made for the medical benefits of cannabis. Heck, when my Mom was dying of cancer more than 20 years ago her family doctor told us he'd have prescribed it for her if he'd been allowed to. But he couldn't so he didn't. And to be fair, he didn't say it would cure her cancer, just make her more comfortable. I also have a circle of friends and acquaintances (people who actually admit to knowing me!) that counts among its members at least two regular users of legally prescribed medical cannabis. One of the legal users has repeatedly commented about how the stuff has helped with arthritis, and how unexpected that had been since initially, he/she/it says, he/she/it just wanted a prescription so he/she/it could get loaded legally as well as pay for it via credit card instead of cash. So, there's that. Other friends admit to having used cannabis for decades, thumbing their noses at "the Man" while raising families, building businesses – in other words, living normal lives other than being scofflaws in this regard. From what I've been told, the medical community recommends that you don't smoke cannabis, for all the same reasons they don't recommend you smoke tobacco. But they're amenable to vaping, the using of a vapourizing device that heats up the cannabis to a point at which it releases its "goodness" (depending on your opinion of the issue, I guess) but without actually setting it on fire and unleashing all that other stuff. Fortunately, there's an abundance of vapourizers on the market to facilitate such activities, and it appears that more are appearing all the time. Over the past year or so I've been approached by vape-making companies (or their PR folk), offering their latest and greatest vapourizers for me to pass around to my circle of friends ("my panel") to get their impressions. 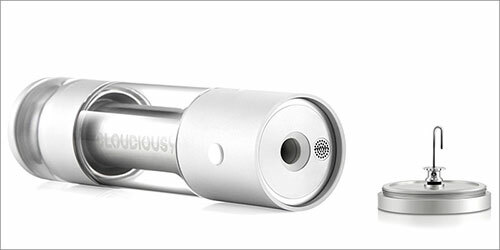 You can see the rest of the articles here, here, here, here and here – and now my friends are bubbling about a new vapourizer that not only does its job well, it hearkens back to the past days of pot parties. That's because it's kind of analogous to a vape version of the old-fashioned water pipe, or bong. 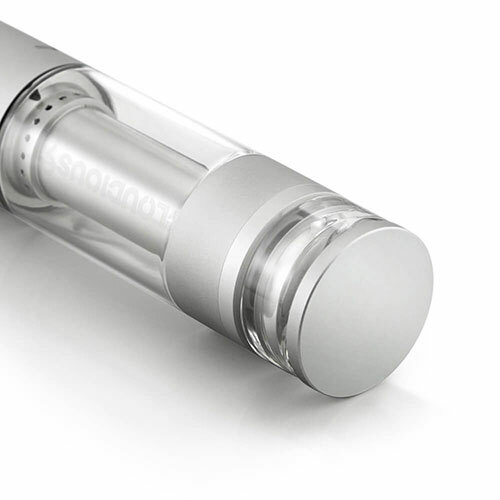 From Cloudicious 9, the Hydrology9 joins products such as Arizer's Extreme Q (which is reminiscent of a hookah) as a kind of blast from the past (or, perhaps, "getting blasted like we did in the past") unit. Who'd have thought a state-of-the-art dope devourer could also be memorabilia? Anyway, this $349 Canadian vapourizer is billed as a portable unit, and it's true that you can pack it around with you, but it isn't nearly as "portable" as the manufacturer might want you to think. I can attest to that from my packing it around with me to various "panel sessions." The issue is that the Hydrology9 is made with plenty of glass and if you're as graceful as I am (you should see the screens of my smart phone and iPad!) it could be quite the shattering experience. Fortunately, you can get a leather carrying case ($50USD) such as the one the supplier included with the sample vape that does a wonderful job of keeping the unit safe, though it's still not particularly pocket friendly. The Hydrology9 itself measures about 45 mm x 175 mm (approx. 1.8 x 6.9 inches) so while it's hardly huge, you still need to take the size into consideration. And as it turned out, the panellists were more than willing to do that once they'd experienced its performance. It's a very cool-looking beastie, looking kind of like one of those old fashioned pneumatic tube thingies one used to see in office buildings (and, for the youngsters who read this, places like Costco). Its metallic and glass construction feels solid, it features a very cool LED light display and – best of all, according to the panel – its vape performance is very good indeed. The first thing you'll want to do upon unpacking the Hydrology9 (not counting charging it up, via the USB adapter that's in the box along with some cleaning tools and the manual), is to add water. You do this by unscrewing the top section, with its metal cap and borosilicate mouthpiece. They suggest you don't fill the reservoir more than 70 per cent and since the reservoir is transparent it's easy to see the level, though it isn't graduated so you have to fill it by eye. On the other hand, you could fill the Hydrology9's other reservoir first, which makes a certain amount of sense since the "herb" goes into a reservoir on the bottom, which means you have to flip the vape over to get at it. This should logically lead to a flow of water escaping from the reservoir, but thanks to the unit's great design the most you might get is a few drops, and that appears to be the exception rather than the rule. The cap on top fits on magnetically, and solidly, helping contribute to the Hydrology9's substantial feel, and undoubtedly helping the water not run all over your feet when you fill the reservoir. To load your "freshly ground herb," you remove the bottom cap (which has a nifty stir tool built into it) and stuff in your stuff. This is why you'll want to flip the unit over; otherwise you'll spend your time picking your grind off the ground. There's a little white button on the bottom section of the unit, and that's what you use to fire it up. Press it three times and it activates, then you can press the button again (or again and again) to choose the heating level you want – from five choices, each of which has its own coloured lighting scheme. The panellists, as often seems the case, preferred the second highest setting. Once it's heated up the water reservoir glows with a green light that, basically, is the green light to start vaping. Remove the cap, stick your mouth over the opening, and draw steadily (and fairly heavily – so you'll want a decent set of lungs) for a few seconds. And then, Bob's your uncle! Most of the panellists thought at first that they weren't getting anything, because the vapour is so smooth and cool, but once they exhaled all became well, indeed. So, while this isn't the easiest vape to use, it rewards its users with big clouds of vapour that work very well (depending on the source material, of course). And thanks to that innovative little stirring stick built into the base, you can ensure you're getting all the goodies from your grind. The downside to that stir stick is that it can get clogged, but that's undoubtedly why the manufacturer has included a cleaning kit. The Hydrology9 charges quickly and battery life is decent. The panel got a few good sessions out of a charge – all they needed, really – but it's claimed you can get up to 15 sessions on a charge. One panellist had difficulty using it because the condition of his lungs meant he couldn't draw as hard as needed, but he was the exception to the rule. 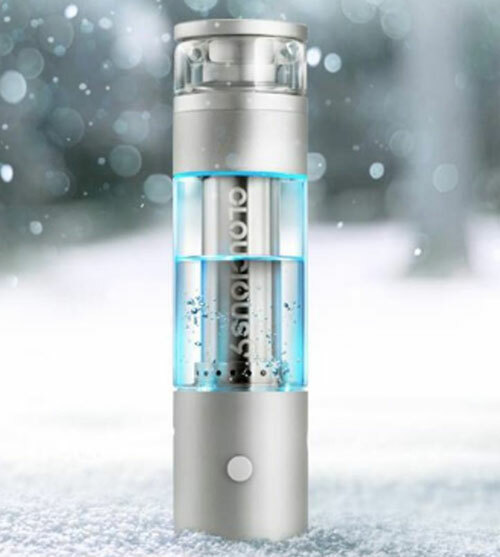 On the whole, the Hydrology9 proved to be a popular product that, despite the extra care you need to take with it (which, to be fair, isn't much more than "glassy" vapourizers such as the Arizer Air and Solo series), did a fine job of bringing joy to its users. And just think: by mid-October, it won't be against the law for Canadians to use! As far as the pending legality is concerned, the upshot from my panellists was that it's no big deal (it isn't as if any of them have been serving jail time yet, after all), especially since it appears that the only thing the government is likely to do with cannabis legalization (besides calling off the legal dogs) is to make it more expensive and add more hoops for the public to jump through. The added bureaucracy could, in fact, send them right back to the "local small and independent businessfolk" they've been using all along.